Deli fresh Boar's Head meats & cheeses as well as many other of your favorite brands. We make the best subs in town! Only $5.99 for a Foot Long Sub! Golden Rotisserie Chicken made fresh daily. Only $5.99 each! 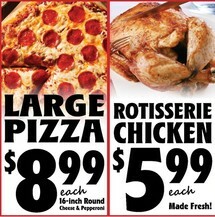 Large 16-inch Cheese or Pepperoni Pizza only $8.99! No time to wait? Call ahead & we'll have it ready for you! 607-625-3341. Don't forget about our Party Platters!